The use of comfort headpieces seems to have arisen over the last 10 years or so. Some people seem under the impression that the horse mustn't have ANY pressure at the poll and not just "uncomfortable pressure" as stated in the adverts for these atrocities called Comfort Headpieces. The term uncomfortable pressure is ambiguous and at the very worst, misleading, it can be and often is, interpreted as any pressure is uncomfortable. 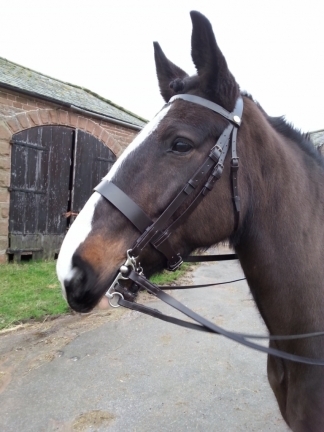 The type/style of bridle used as well as the Bit will determine mainly through leverage which point or points of pressure will be affected at any one time. The art of a good balanced rider with a good seat, hands and balance is to use the points of pressure to their advantage to control the horse by placing the head in the correct position/carriage/outline for what is being asked of the horse. 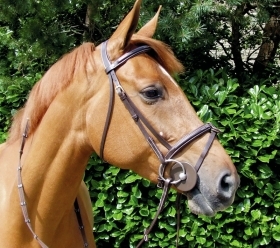 The bridle, when correctly made, will not have any sharp edges or be too narrow to cause discomfort.. The strapwork on a bridle should be wide enough to spread the load/pressure so as not to make it painful for the horse. You HAVE to have some pressure. If you don't you will not have much control. You can use leg aids, seat and balance of course but you need pressure to have as much control as possible. I have seen riders with no tack at all who can do things with their horses that most ordinary riders would struggle with fully tacked up, but these gifted individuals are few and far between. Your average joe public everyday rider is who this article is aimed at, pretty much like me for instance! I liken thin bridlework with pressure on the key points something like having a heavy bag of shopping with thin handles. It will eventually cut in/dig in to your hand/fingers and hurt, yes? Now pick up a simlar bag with thick wide handles, see the difference? This is why bridles are painful/uncomfortable for the horse wearing it, in the wrong hands of novice unbalanced riders you have a recipe for being unseated and a seemingly badly behaved horse! Add to the fact some people don't clean and condition their leather tack very often it makes things worse by the leather being hard and it will rub. So, along comes a bright spark who designed the comfort headpiece to alleviate the "uncomfortable" pressure, the original bridles which shall not be named were made by a Saddler who in my opinion has no material science skills. Why no one has thought of it I really don't know, my next project perhaps, making them? They use a crew punch to punch a hole across the headpiece to allow the noseband headstrap through it. That leaves very little width of solid leather where the crew hole is. great on a youngster or a nervous horse on a busy road. One could say the sewn in lining gives it strength, well you cannot rely on thin lining hide and a bit of foam padding to hold it all together when you have up to half a ton of horse pulling on it, it simply is not strong enough to hold it together. Think of kitchen roll, if you try to pull a sheet of that off the roll without using the perforations, it's hard to do now pull it along the perforations, how much easier is it to do? Now equate that to the leather headpiece in the picture, the more holes the weaker you have made that piece of leather and if it's going to fail it will tear along any holes. Choice is yours of course but DO question WHY you want a comfort headpiece in the first place? If your horse has a poll injury or it very sensitive there, then ok but if it's purely because you think there is pressure at the poll and there shouldn't be any, please think again. If your horse is sensitive there try using a wider headpiece for a while to see if the sensitivity goes. Give it time, the pain won't simply disappear over night no matter how well anything fits. Lastly, I feel I must add this, we have come so far away from the tradtional saddlery of my era and in to cheap massed (often incorrectly) produced saddlery by manufacturers with machines rather than traditional craftsmen/women who have the necessary skills to make things properly that we are going to see more and more horses with saddlery related problems. Just look at the amount of "remedial" pads for saddles there are now! 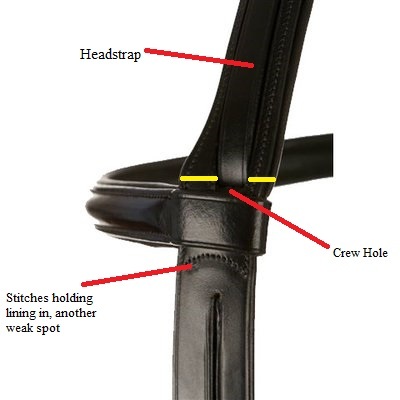 As with all saddlery or lorinery related problems,try fixing the cause rather than the symptoms. Riders too can play a large part in helping things by learning as much as they can about saddlery including lorinery, what it's for, what it does, do you really need it and how it should be made. Remember, everything in traditional saddlery is made a certain way and for a good reason.